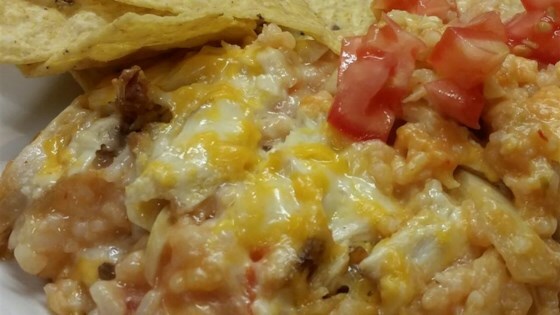 "Layers of rice, chicken breast, a creamy soup and salsa mixture and two kinds of cheese add up to a simply yummy salsa casserole! This recipe is a family favorite because it's delicious and easily made with ingredients found in the pantry." Place rice and water in a saucepan, and bring to a boil. Reduce heat to low, cover, and simmer for 20 minutes. In a medium bowl, combine Monterey Jack and Cheddar cheeses. In a separate bowl, mix together cream of chicken soup, cream of mushroom soup, onion, and salsa. Layer 1/2 of the rice, 1/2 of the chicken, 1/2 of the soup and salsa mixture, and 1/2 of the cheese mixture in prepared dish. Repeat layers, ending with cheese. See how to make a top-rated, Mexican-inspired casserole.